Dr. Sonoda Setsuko, an award winning transnational historian from Japan, recently gave a public research seminar at the School of East Asian Studies. Her seminar offered a fascinating account of transnational developments in the Chinese community in former British colony Trinidad and Tobago, covering continuities and changes between the pre-WWII and Cold War eras. By utilizing multi-archival historical research, she skillfully reconstructed multi-layered dynamics that shaped the social history of the Chinese immigrant community in Port of Spain, the capital city of Trinidad. Her paper was particularly successful in demonstrating that a state-centric approach alone is not enough when conducting research about transnational phenomena, such as migration and accompanying transformation of identity of immigrants and their community. She successfully examined the confluence among of imperial, transnational, and local forces that shaped the situation in the Chinese community, while showing variations between the 1930s and the Cold War era, which accompanied a confrontation between pro-Nationalist and pro-Communist communities in Port of Spain. Her research is based on the mainstream research method in global and transnational history, and offered highly useful insights when examining East Asia related issues in the context of global and transnational dynamics. It also reminded the audience that by imaginatively connecting the global, regional, and local developments, researchers can shed new light on history. Her research also exemplified the importance of multi-archival approach to reconstruct transnational phenomena, as was underscored by Emily S. Rosenberg and Akira Iriye in their co-authored volume, World Connecting (Harvard University Press, 2012). In modern and contemporary history, overseas Chinese have experienced both exclusion from and integration into the nation receiving them. Politically categorized, ethnicized, and marginalized, countries receiving overseas Chinese have long treated them as aliens and foreign-born groups, even after the emergence of the local-born second and subsequent generations. On the other hand, the government of China, the sending country, has built and reinforced ties with overseas Chinese to include them as citizens by setting up a special institution, the Overseas Community Affairs Council. The marginalization of immigrants is inextricably linked to the building of modern nation states among both the receiving and sending countries. During the second and third quarters of the twentieth century in Chinese communities in Port of Spain, Trinidad, the process of exclusion from and integration into the receiving and sending countries was apparent. 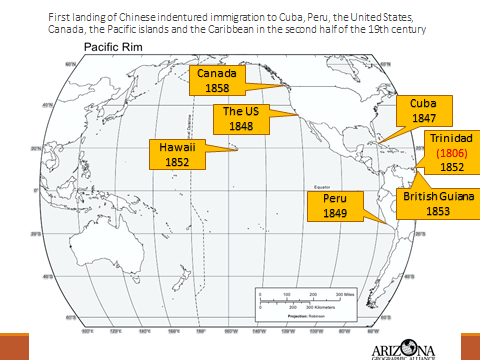 However this process largely differed from those of the overseas Chinese in North and South America. The situation in Trinidad reflected the subsequent independence of Trinidad, the sociocultural milieu of Trinidad as a former colony of Britain, and the Chinese government’s transnational politics, especially that of the Chinese Nationalist Party (Kuomintang: KMT), not to mention the influence of Cold War alignments in later years. My paper examines the formation of a community structure in Port of Spain, Chinatown, in Trinidad from 1930 to 1970, and its transformation from the exclusion/integration perspective described above. Through a close examination of Chinese newspapers in Port of Spain, documents from British and Chinese authorities, and a thorough analysis of private writings by KMT officials, my paper examines how British authorities and Trinidad media integrated overseas Chinese into Trinidadian society. It shows how the Chinese officials, dispatched by Chiang Kai-shek’s KMT, implemented the KMT’s overseas Chinese policies and established infrastructure facilities in Chinatown while carrying out propaganda activities during the WWII and the Cold War. How political confrontations in East Asia during the Cold War led to conflicts and antagonism between sympathizers of the People’s Republic of China and the pro-KMT community in Chinatown in Port of Spain is also examined. This paper also reveals the role of the highly politicized pro-KMT Chinese community during the Cold War era, while showing the relationship between trans-border communities and the nation–state in the twentieth century. What sources did you consult with for this historical research? I analyzed the inside structure of Chinatown in Port of Spain and its change between the 1930s and the 1960s, utilizing little-known historical materials in Trinidad and the USA: the Chinese newspapers published in Chinatown of Port of Spain, such as Chiao Sheng, Zili Bao and Cheng Chi Bao. I also utilized other newspapers that have been stored at the National Archives of Trinidad and Tobago, and the autobiography and diary of Chen Jiaxian (1900-1983), which was donated by his family to the Hoover Institution Archives at Stanford University in 2011. The national newspaper of Trinidad, the Trinidad Guardian, stored at the British Library is also a wonderful source to analyze the local-born second and following generations of Chinese in Trinidad. How and why did you come to choose this transnational issue as the focus of your research? My great-grandfather’s sister immigrated to Canada as a picture-bride for a Japanese Canadian in Alberta, Canada, in the first half of the 20th century. Her descendants had sent letters and Christmas cakes to my home in Japan every year, and I had witnessed these private transnational ties between Canada and Japan from my girlhood. This experience made me think about less-well-known history of Asian migration as well as marginalized populations in the periphery of a state. Dr. Setsuko Sonoda is Professor in the School of Economics in the University of Hyogo, Kobe City, Japan, and specializes in modern Chinese history and area studies. She has been researching the modern and contemporary history of overseas Chinese in Americas. Her first book, Overseas Chinese in the Americas and Modern China: Transnational Migration in the Nineteenth Century [in Japanese] (Tokyo: University of Tokyo Press, 2009), discussed the transnational nature of Chinese communities in North and South America and the policies of the Qing Empire toward them. This monograph was awarded the 7th Iue Asia Pacific Research Prize. She was a Fox International Visiting Fellow at the Yale Center for International and Area Studies 2000-2001 and is currently a visiting scholar at the Oxford Centre for Global History (2016-2017).